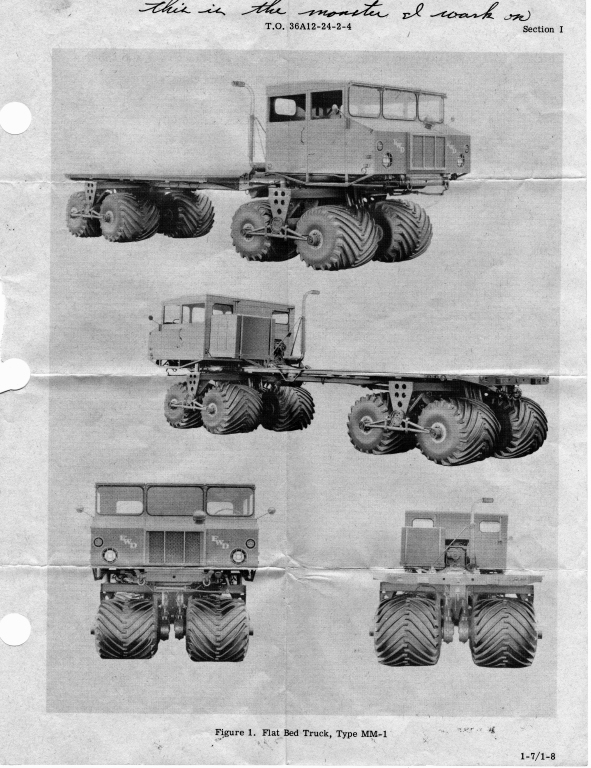 " This is a front view of the teracruzer I learned to drive in 1963. We referred to the teracruzer as a MM1. It was powered by an opposed 8 cylinder Aircraft "Continental Engine" It used aviation fuel (145 octane gas). The transmission was a 4 speed Torque Converter, and power could be applied to all wheels." 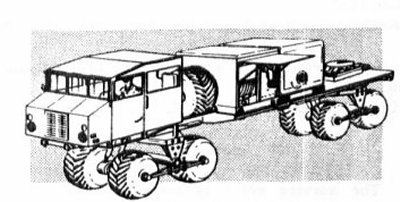 "The front suspension was manually adjustable so the driver could slant the front wheel set "bogies" upward to climb large obstructions. Air pressure in all the tires could be adjusted on the go by switches on the dash. This allowed higher pressures for highway travel and lower pressure for off road travel, sand or mud." "The vehicle had several different rear body types. 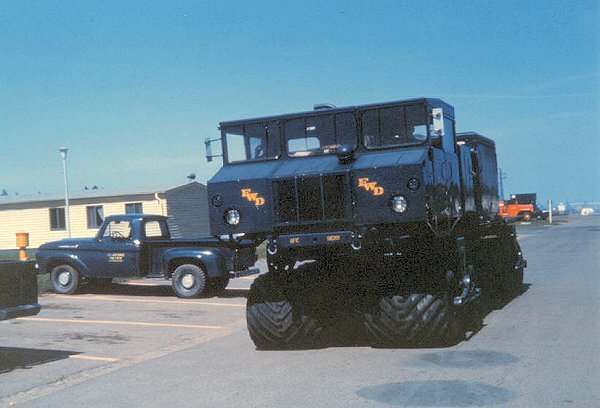 Some were fifth wheel setups for towing the MACE Launcher, while others were equipped as fuel haulers, and others like the attached photo had Warhead or Missile Guidance section cradles for transporting Missile nose and warhead sections." Photo by Glenn L. Martin Co.
"FWD Teracruzer Gives Mobility To New USAF Tactical Missile"
"Four Wheel Drive Auto Company has developed its revolutionary concept in overland transportation—the famed “balloon-tired” FWD Teracruzer — as tactical ground support equipment for the U. S. Air Force TM-6lB (Matador) guided missile." 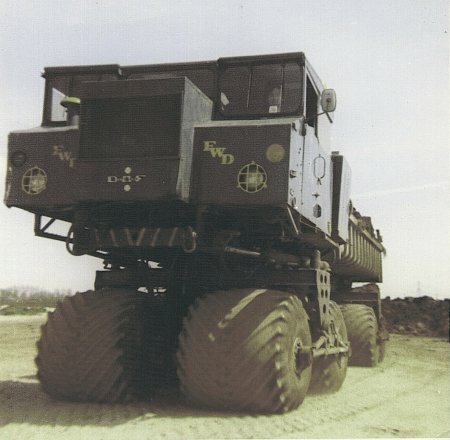 The MM-1 was built in Clintonville, Wisconsin, by the Four Wheel Drive corporation. The U.S. Air Force received 189 of the MM-1 units, (Nameplate Nomenclature - Model 8-320-B2 Type MM-1 Flatbed Truck), at a cost of $35,366 each. MM-1 Teracruzer with Mace "A" in display at Lowry AFB (ATC for Air Training Command, LAFB for Lowry Air Force Base, on cab), 1959. 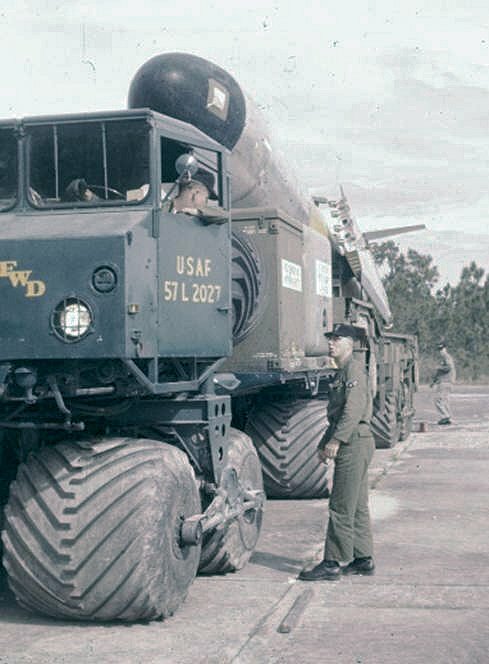 The units at Orlando Air Force Base belonged to the 4504th Missile Training Wing, 9th Air Force, TAC. An MM-1 after washing at Grünstadt (C-Flight), Sembach, Germany, 38th TMW. "Good stuff on the MM1, much to my chagrin I neglected to take any pictures of my time in Orlando with the teracruzer. For your amusement though here are a few recollections. The picture of the just washed teracruzer reminds me of Veterans Day 1959 when support squadron was to "Detail" a MM1 so it could be placed on display in Orlando. After a through wash job we waxed it (Yes! Waxed a MM1) but, that wasn’t shinny enough so after driving it into Orlando and setting up 3 of us were instructed to wipe down the entire vehicle with oil-soaked rags to make it shine, and it really did too. However after the display and drive back to base you can imagine what kind of a dusty, gritty mess it became. Took longer to clean it up when it got back than it did before it left. As with most mechanical items there always seems to be a lemon in the bunch and I remember well, that of all the teracruzers we had at Orlando 57L2021 was the queen of the shop. It always was down for something. Also probably the most broken part on the MM1 was the about 20’ long remote throttle cable that went from the engine to the remote plate about ½ way back on the bed. 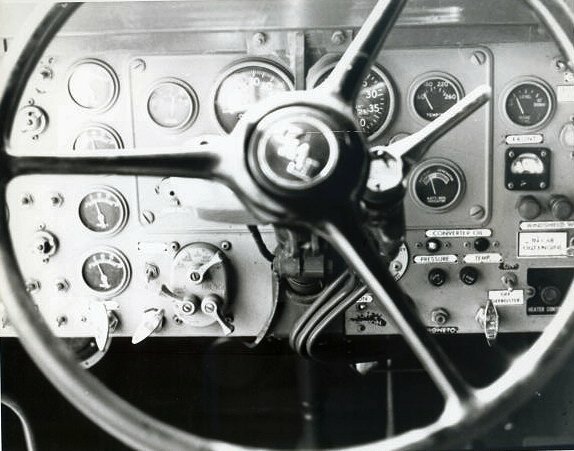 This is where the operators would control the engine for stationary use; somehow they managed to tear them up on a continuous basis. I bet I changed out a zillion of those things. 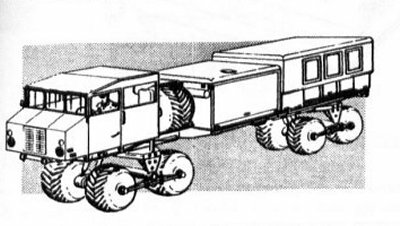 Another thing was that there was always 4 large pieces of 8X8 wood in the teracruzer to put under the pivot point of the bogies when parked so when (not if) the tires went down the truck wouldn’t squish down. You mentioned the trucks were made light and that brought to mind a couple of incidents that I remember. One was with a FWD tech rep who demonstrated the "soft footprint" the MM1 was capable of. He ran the air pressure down low (6 PSI. I think) on the 2 left front tires and then laid down on the sand and had one of the other reps. drive over him and it didn’t even crush the pack of smokes he had in his shirt pocket. 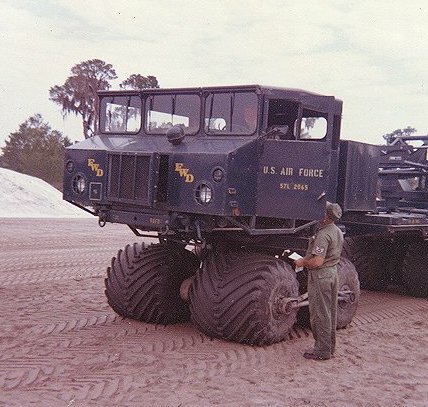 The other was when a student drove into one of the shallow lakes over by the NCO club with a flatbed MM1 and the huge tera tires caused the back end to float up like a cork. Thanks for your work on the site and if you come up with any more MM1 stuff or hear from anyone else who worked on them especially if the were at Orlando 1959/1961 please contact me." Sketch by Glenn L. Martin, Co. I have a model of the Mace and would like to add vehicles that were part of the support. 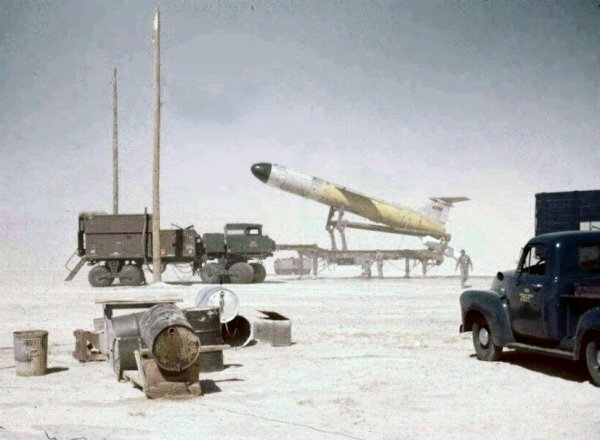 1) Can you tell me how many vehicles were required to launch the mace missile, obviously the teracruser and mace trailer, what other equipment. 2) teracruzer What other types of vehicle were based on the teracruser, your pictures show a crane and I have seen a flat bed type? sorry to bother you again, I have another question. The Terracruser carried two containers 1 I think fuel the other launch equipment. How were these placed on the ground for launch. Fred Horky, LtCol USAF (Ret). 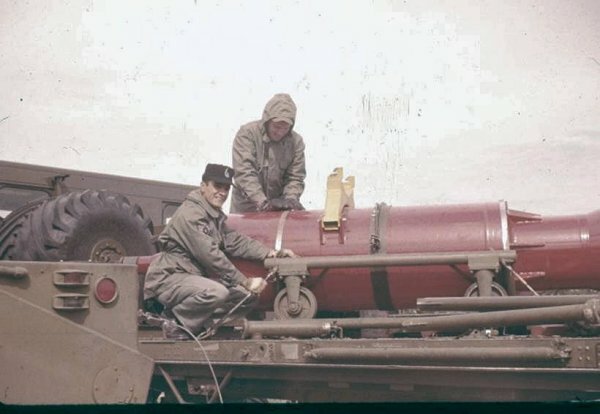 The Mace was first intended as a mobile ground launched missile system (it would be called a “Cruise Missile” today) that could be deployed cross-country, thus making it a much harder target for potential enemies ….the old “shell game”. The Air Force in its wisdom also required that it be Air Transportable. 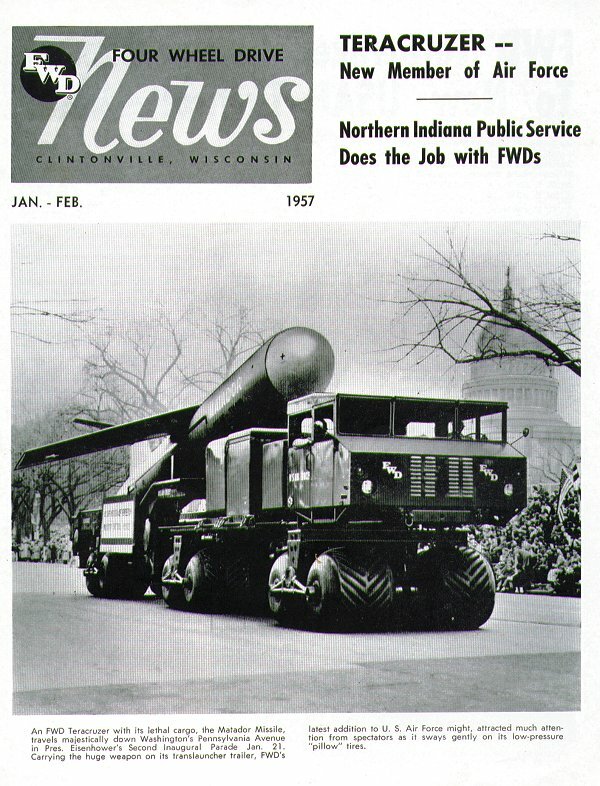 Thus, the contractors, including FWD (Four Wheel Drive, of Clinton WI, builder of the prime mover truck), Goodyear Aerospace, Fruehauf (the translauncher), and others did a marvelous job on both counts. 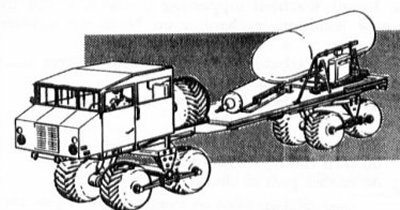 But I’m glad I didn’t have to pay for the unused mobility and airtransportability provided by the huge (expensive) Goodyear TerraTires, aluminum construction, powerful, lightweight, air cooled, flat-eight cylinder Continental engine which required 115/145 octane aviation fuel in the prime mover! That’s the portable system we deployed to Europe. Obviously there was no way in hell in peacetime that we would be doing a “first-strike” on the Russkies; and also that German farmers would not likely allow us in peace time to routinely run willy-nilly cross country over their fields and through their fences in training for the real thing! Remember, you always have to train like you fight! 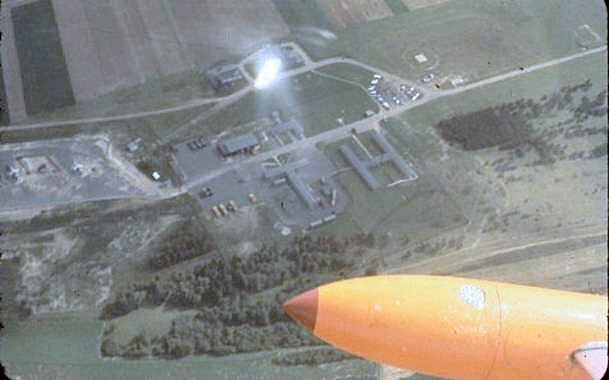 We developed this site on a flat topped hill overlooking the Rhine near Grϋnstadt ..converting it from a USAF Security Service radio spy site. Note at left, two missiles on the first two of the original 8 (later 16 with RFML) “soft” launch pads. Picture shot from the front seat of my T-bird: I did have a good time on this tour! The sun reflection in the curved canopy blots out Grϋnstadt’s famous chow hall …best in USAFE! What could have been a much cheaper, NON-mobile system to design, build, and use system with regular G.I. 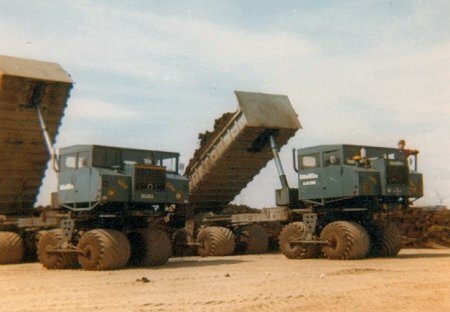 M-series trucks as prime movers, thus turned out to be expensive and inconvenient. For example, I can’t prove it, but believe the only time any of this “air transportable” equipment ever “flew”, was likely only once during its initial air transportable tests. They called the new system RFML (Rapid Fire Multiple Launch). It had clusters of four missiles loaded (in every sense of the word) and elevated on the same translaunchers, with electronic “keep-alive” power on all the time so they could be maintained on a much shorter and simpler launch alert countdown. 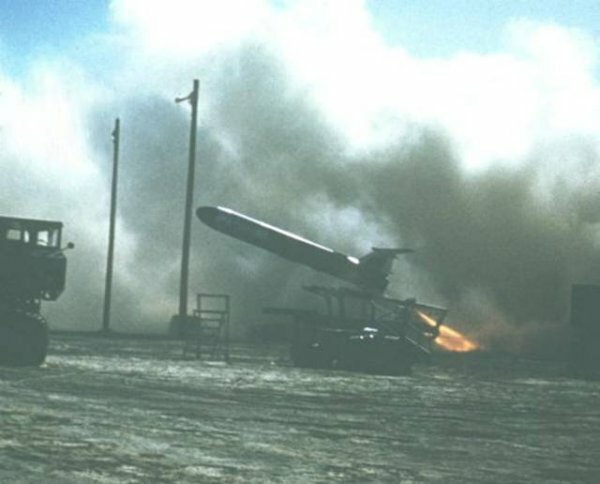 The missiles were assembled, tested, and “cocked” by maintenance crews. 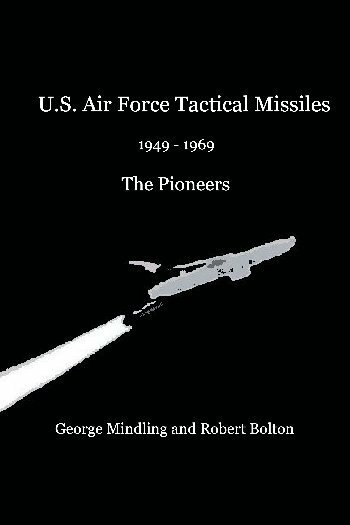 They were then held on alert, where they would be fired from a central block house by a much smaller launch crew of four whose only duties (at least with the missiles) was alert duty. Eventually where there had been eight alert missiles there were sixteen. They did build weather shelters (NOT hardened) to keep the weather, especially Germany’s freezing fog and snow, off the “birds”. But that was after my time. But I’ve digressed from your questions. 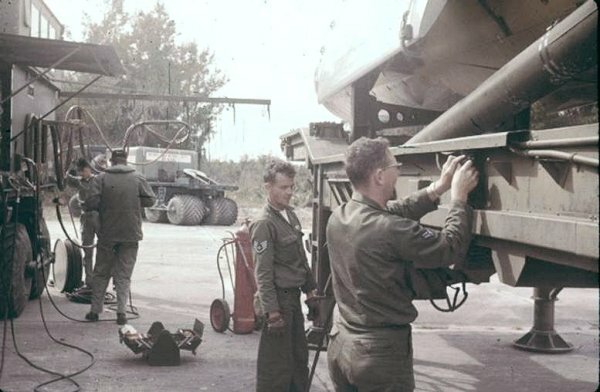 The original design did make the ground support equipment more interesting (read “neater”, for modelers) than the missile itself, which is probably why Renwal chose to do a major kit of the system to begin with! D. The Nose and Booster MM1 truck. 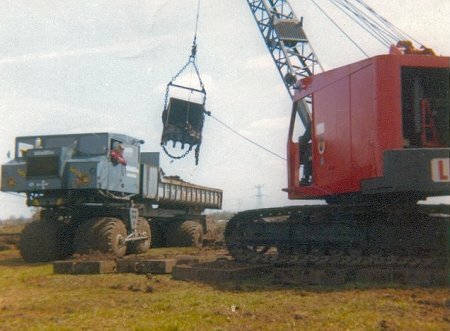 2) What other types of vehicle were based on the teracruser, your pictures show a crane and I have seen a flat bed type? FWD’s MM1 truck (and that designation was the company’s “Military Model 1” title:, this unique truck never did get a military-standard “M-series” designation) was the basic, all-aluminum, collapsible cab (to fit in a C-124, remember!) flat bed truck. 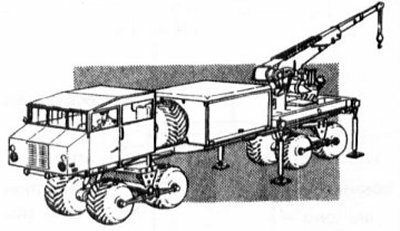 Add onto the standard MM1 flatbed a rectangular 1000 gallon tank (with JP-4 fuel for the missile), a rectangular pump/hose pack to pump the fuel via the power takeoff on every MM1, and a more or less standard “fifth wheel” for towing to the truck, and it became the basic prime mover for the missile. See picture below. Put other stuff on a MM1 and it did other things. 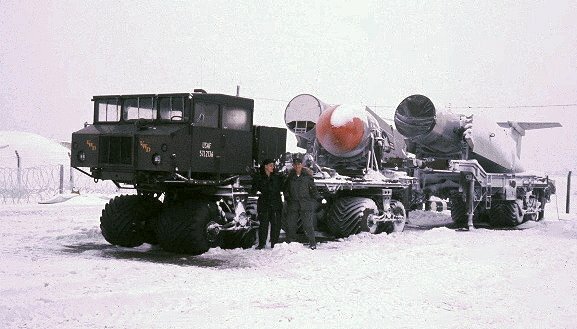 Thus, all the launch area vehicles were built building-block style with a flat bed MM1. Since they were easily switched around, different combinations were seen, including just a bare flat bed. Besides the fragility of things like warheads and electronics (not to mention nuclear safety rules), there was an overhead clearance problem too, on low bridges and stoplights. The stoplight below is at the corner of Colonial Drive and Bennett very near the present day terminal of Orlando Executive Airport, long ago originally built far, far outside that sleepy southern town, as Orlando Army Air Field! 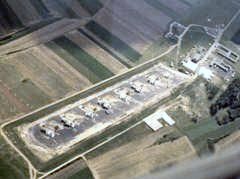 Even further out in the boondocks, among the pine forests and alligators, an isolated test and training station called Orlando Auxiliary Air Field was also built. It later became a SAC bomber base named Pinecastle AFB, (after the then tiny nearby village), then renamed McCoy AFB (after a Wing CO named McCoy who managed to pull the wings off a B-47), and now demilitarized and named Orlando International Airport. It’s now completely surrounded by sprawl and Disney. But that huge airport still has the ICAO and airline baggage ticket title of “MCO” ... for McCoy! Learn something every day! This picture was in a training situation back at Orlando …we were using abandoned WWII P-51 training hard stands at the former Orlando AAF for our setup training. Our N&B pack that day was unserviceable, and we got special permission to transport our “training aid” missile with the nose still on. 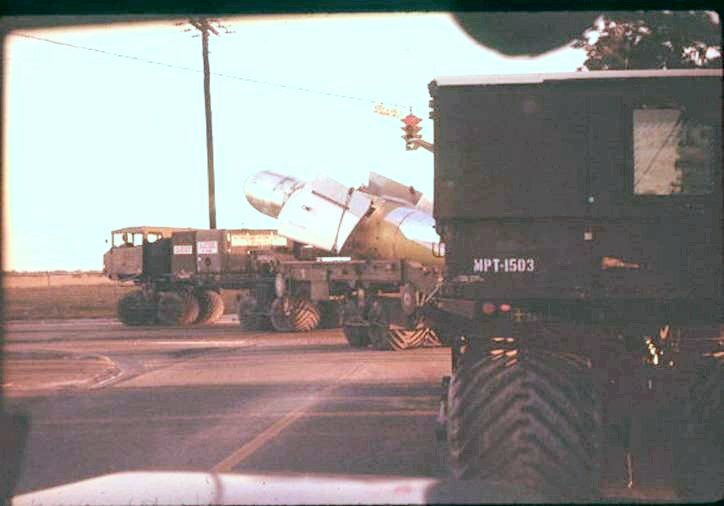 The “N&B Pack” truck carried, obviously, the missile NOSE (W/H and guidance sections) and the BOOSTER. The guidance system radome here was a damaged article painted red to show it as not-flightworthy They were retained, painted red, and used only to transport nose sections, saving the good ones. …where aluminum channel rails were manually used to inch the booster on its hard-rubber wheeled cradle down under the tail of the missile, where regular-issue bomb hoists were used to lift it into position. The “live” boosters were always painted gloss white. Again, this one is an expended rocket painted red and retained as a training aid. 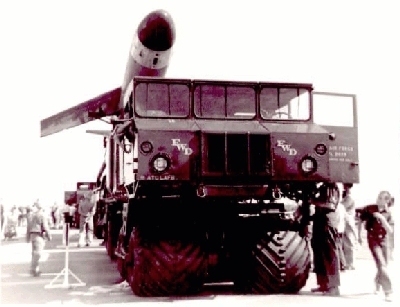 The booster cradle sat at an angle on the truck, and was turned to align it with the missile before inching the booster down the rails. When in place, the booster was sort of just held there by the translauncher cradle and the missile. 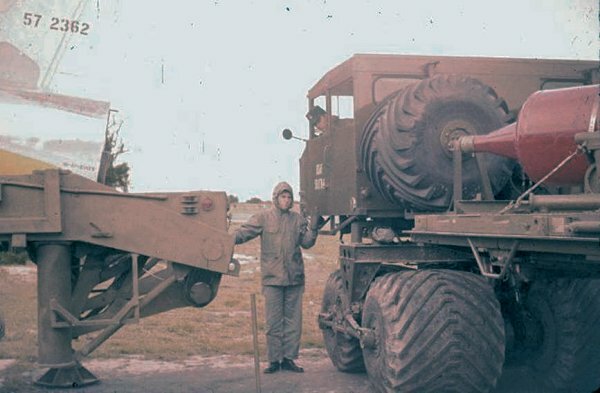 The last unit of equipment needed in a single-round missile “battery” under the original “mobile launch” concept, was another flat bed MM1 equipped with a rectangular “Power Pack” behind the cab, and driven by the truck’s PTO. 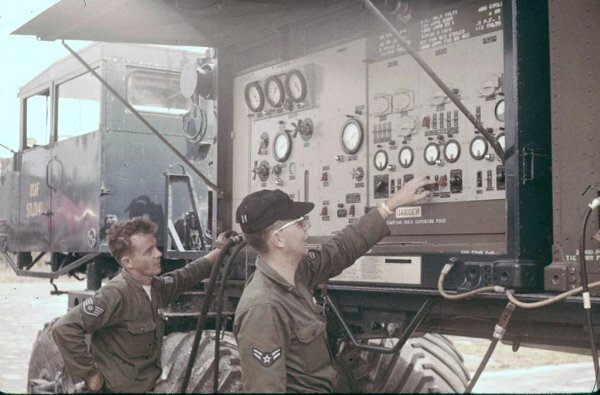 During the original “mobile” countdown, the MPT vehicle and the missile alongside on its translauncher were connected by a veritable maze of multi-pin cables, hoses, and radar wave guides, grounding wires, etc. My guys have just gotten started here: only a SMALL fraction of the hoses, cables, and stuff are hooked up yet! Just before launch this was all disconnected and left dangling on booms on the side of the MPT vehicle as it was backed clear and moved to a (hopefully!) safe distance …all except for one cable: the 150’ long umbilical cable. That much distance was the minimum to avoid being made toast by that 100,000 pound Thikol solid booster rocket. 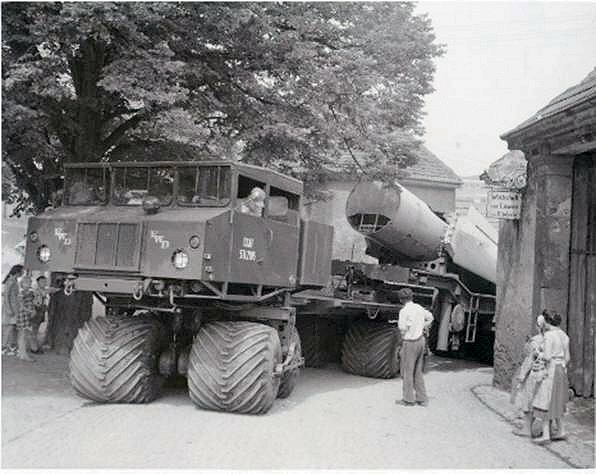 The picture below is in Germany, and shows a “flat-bed” MM1 with fifth-wheel-only, navigating a missile through THE one street of Mertesheim, very near our launch site at Grϋnstadt. 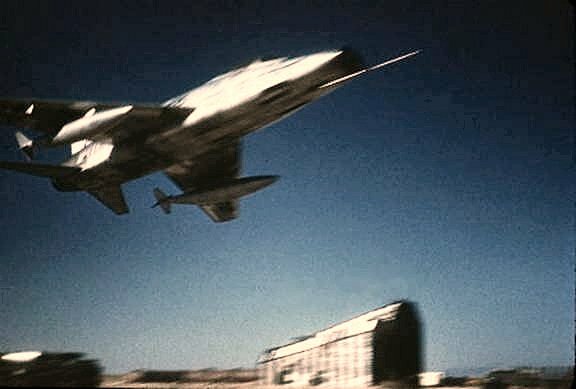 On launch the booster’s 102,000 pound thrust (for two seconds!) first sheared one last bolt holding missile to translauncher: the thrust then held the booster in place until burn out and it fell away to land a mile or so away. That thing would out-drag my Corvette! J The noise would get your attention, too! The F-100 in this picture was our “range safety” chase airplane “buzzing” the missile during count-down to test his telemetry links. Hope that this all helps! "With great pleasure I read your mail and I was pleased that al last there is somebody who knew this special vehicle,(maybe better than I do)." "You asked me particularly, for what purpose the Dutch used the MM 1." "In the end of the sixties these vehicles where transported from Germany (US-Air force) to Holland by a surplus dealer from Rotterdam. My former employer from Amsterdam discovered these vehicles and purchased eight in order to use them for proceedings in the making of new highways in the neighbourhood of Amsterdam, (the bottom of that part of Holland was very soft)." "Six of these vehicles has been modified; the original engines where replaced by DAF, SCANIA and VOLVO diesels, the cargo-capacity replaced by kippers, and also the steering wheel replaced by so called steering valve in order to make steering easier . Two of the vehicles where used for spare. These MM I,s served till approximately 1976 and were finally demobbed for scrap, because they where no longer useful for this special work." "I found five other Dutch companies who used the Teracruizer during this particularly period. For many years my hobby is to collect and restore military vehicles, but I, am still searching for pictures, books, articles and parts of this special vehicle. Till this moment my only result is your mail. It’s a great wish to see the Teracruizer for ones, but as far as I know no more than 600 examples are ever build, so it would be difficult to find a working MM 1." "You asked me permission to distribute the pictures I send you, please feel free. If you sir have any information of the Teracruizer, please share this with me, and I also follow the site with great interest." "If you have any questions, please feel free to ask. With regards,"
A series of two minute Air Force Promotional films was distributed freely to every Television Station in the country. Among the Lowell Thomas narrated shorts is one that features the MM-1 and the TM-76 Mace. The video (Stock#:AFF226) can be can be found at Footage Bakery. The Mace and the MM-1 clip are the last item on the page.